For a somber evening filled with political overtones, the Concert Across America to End Gun Violence certainly featured quite a lot of musical fun. Kenny Loggins, Christopher Cross and Michael McDonald were just some of the noteworthy figures who took the Arlington Theatre stage on Sep. 25 at the community-organized show, which was one of 250 concerts across 45 states on the same night. Though some traffic in the line for entrance delayed the start of the concert, there was no looking back once the show began. The night ran well over three hours, but the assortment of musicians coordinated neatly into a series of arrangements. Kenny Loggins took the stage at the tail end of a lengthy night of music, delivering classics like “This is It” and “Danny’s Song,” the latter of which he had recorded as part of his original pop duo, Loggins and Messina. The highlight of his set, however, was the multiple Grammy Award-winning “What a Fool Believes,” which he performed onstage with song co-writer Michael McDonald. McDonald himself was one of the more notable performers of the evening, having collaborated with a number of chart-topping artists after his lengthy run singing lead for The Doobie Brothers in the 1970’s. He and Loggins shared the stage, along with endless permutations of the other listed acts of the evening. 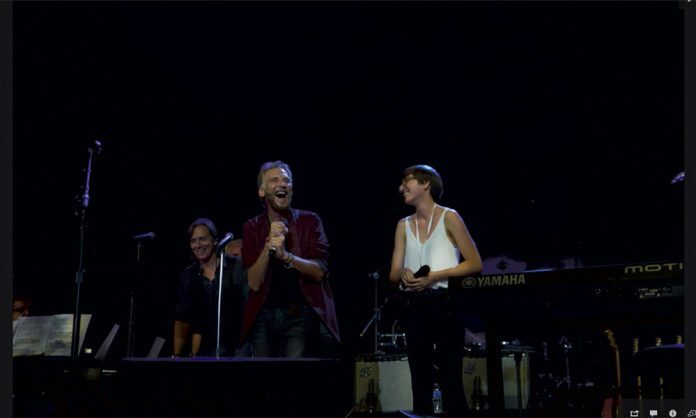 Family members, also made appearances; Loggins brought out his daughter, Hana, for a song, and McDonald called up his wife, Grammy-nominated Amy Holland, for a few others. Most notably, talented Santa Barbara High School senior Jackson C. Gillies sang lead with Loggins on “What a Fool Believes,” which might have been an appropriate closer to the entire concert (it was not; the show ran for another half hour). Another Grammy-winning artist, Christopher Cross, played a short set of his music. UCSB-alum and Jack Johnson-contemporary Zach Gill delighted the crowd with an enjoyable series of folksy accordion tunes. Venice, a family-based band (all four members share the name Lennon) strung the evening together with some keyboard and guitar-based rock songs. Los Angeles-based group Ozomatli (featuring singer Rocky Dawuni) brought the house down before the intermission, powering through some soulful melodies on a foundation of jazz and salsa. Local talent filled out the evening’s artists. DMK Studio and the Santa Barbara School of Music took the stage at one point to honor the late Emily Han, whose family was murdered in a triple homicide in March near Goleta. UCSB a capella group Naked Voices sang at another. The charm of these smaller acts was how they advanced the overarching theme of peace. Most of the evening’s songs called for the end of violence, while also pleading for “revolution.” The intended point of the concert was not lost among all of the evening’s talent. If the music did not convey the message loud enough, however, the concert was star-studded with famous and important names to drive home the motif. Santa Barbara Mayor Helene Schneider and former “Second Lady” Tipper Gore occupied the stage at different times to speak about the need to end gun violence and push through new gun legislation. Specifically, concert speakers rallied around passing Proposition 63, a gun and ammunition control measure, which will appear on the ballot in November. Other notable people videoed in, including singer and UCSB-alumnus Jack Johnson, Lt. Gov. of Calif. Gavin Newsom and actor Jeff Bridges. Autographed instruments from the band Maroon 5 were presented in a silent auction at the intermission. Weiss called gun violence in the United States an “epidemic” for the frequent nature of gun-related violence. “While we’re sitting in this theater tonight, 15 people will be shot to death,” he said. Another speaker, Dr. Jason Prystowski, worked as an emergency physician in Goleta and tended to victims of the Isla Vista shooting. He presented the audience with a series of questions about guns and mental health. “Why are there so many more discount gun stores than there are mental health facilities?” he asked at one point. The somber speeches supplemented the mostly lighthearted music, completing a mixed bag of performances for the evening. For a grandiose title, the Concert Across America to End Gun Violence lived up to the hype. October: The original article stated that Amy Holland was a Grammy winner and the concert took place on Sep. 27. Holland was a nominee and the concert took place on Sep. 25. Wonderful review of the show but the concert took place on Sunday September 25th 2016 and Amy Holland was nominated in the best new artist category but didn’t win. Christoper Cross took home the Grammy. Democrats kill other democrats and democrats want to disarm republicans. Read the FBI UCR crime stats if you really want facts on violent crime and murder in the USA. Violent crime and murder rates are way down from a peak in the 1990s is one take away. Another is that young black men kill other young black men at a rate which is 7+ times higher than everyone else in the country. 3%+ commit 50% of all murders. If you really want to reduce crime then that’s the population whose behavior needs changing. Now you can call me a racist. Not true, but you’ll use that excuse to distract from the hard facts.